Automobile infotainment systems have evolved in recent years from simple stereo head units to massive touchscreen centerpieces responsible for all sorts of in-car activities. Here's a look at five of them. In a story Feb. 26 about infotainment systems, Edmunds reported erroneously the name of Hyundai’s system. It is Blue Link, not Uvo. Automobile infotainment systems have evolved in recent years from simple stereo head units to massive touchscreen centerpieces responsible for all sorts of in-car activities. Infotainment systems can manage climate control, navigation and even seat adjustments. That’s on top of providing displays for safety features, doubling as rearview cameras, and housing such things as maintenance schedules for vehicles. However, not all of these screens and interfaces are created equal. Each manufacturer has its own take on buttons, knobs and controls — and their location. The size of the screen is important, but so is the operating speed and the ease with which a driver can change radio stations or lower the volume without looking away from the road. Blue Link is available in a number of Hyundai and Kia products and it’s one of our favorite-yet-simple systems. One particularly good example of the Blue Link system can be found in the Hyundai Kona. The system may not be particularly flashy or visually impressive, but the screen is easy to see and understand while the controls sit easily at hand. It’s an easy system to learn, even if you aren’t particularly tech-savvy. And, Blue Link feels particularly upscale inside Hyundai’s reasonably priced cars. For several years, the Ford Sync system has been at the top of its game when it comes to usability. A logical four-quadrant layout on the touchscreen and top-notch voice controls mean that the system can be controlled at a glance or with simple voice controls. The Ford’s system understands natural language without requiring lots of menus and submenus just to access specific functions, such as navigation. The display isn’t outstanding or unique in many ways, just basic and easy to use. Simple but elegant, Mazda’s center-console system relies on a rotary dial for most of its commands. It’s so intuitive that you can largely keep your eyes on the road while scrolling through radio stations, for example. The dial is large and has lots of tactile points, and the direction of rotation is logical. It feels as if it belongs in a luxury vehicle but you can get it without the luxury price. Some 2018 Mazda models are missing Apple CarPlay and Android Auto compatibility, but the proprietary system is so good that we don’t fault Mazda for that. Mazda, however, knows how indispensable those systems are becoming and is adding them to most 2019 models. One of the easiest to use and classiest systems on the market is the new Mercedes-Benz User Experience or MBUX. 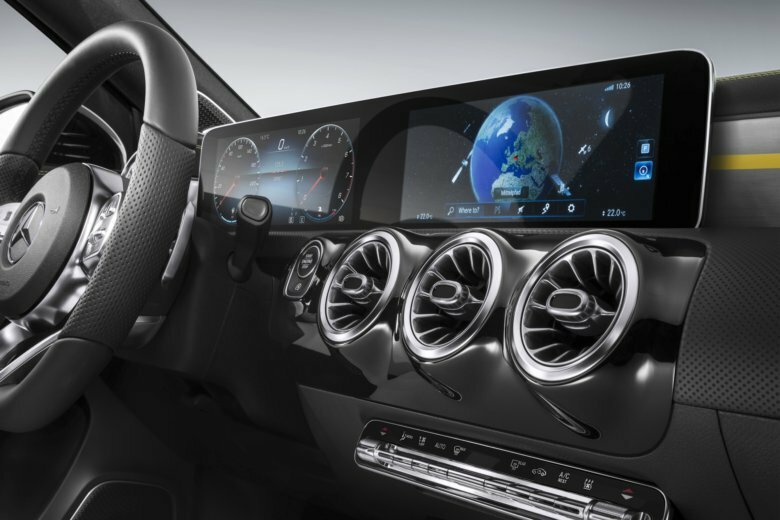 Available in the new entry-level Mercedes A-Class, the MBUX system is attractive, with ultra-crisp graphics and an elegant integration on the dashboard. Like any good system, the MBUX has lots of operation redundancies, the better to suit your preferences. Whether it’s the steering wheel’s touch-sensitive pads, the center touchscreen, the pad behind the cupholders or the extremely responsive voice-control system, there are lots of easy and intuitive ways to get the system to do what you want. Ram trucks have one of the biggest center screens in the business. Measuring 12.3 inches diagonally, this optional center console essentially stacks two conventional screens. While that might sound intimidating, the layout of the controls and the sheer responsiveness of the Uconnect system make it very easy to use. Ram’s version of Uconnect (which also is available on Chrysler, Dodge, Jeep and Fiat vehicles) has been a favorite of ours in the past, and this newest version combines greater usability with an impressive display. This massive screen, available in the 1500, 2500 and 3500 trucks, is a class leader, challenging other makers to step up their offerings. EDMUNDS SAYS: There are a lot of high-tech systems to choose from these days, and it’s just as important to test them as it is to assess how the car drives. This story was provided to The Associated Press by the automotive website Edmunds. Travis Langness is a reviews editor at Edmunds.com: Twitter: @travislangness.